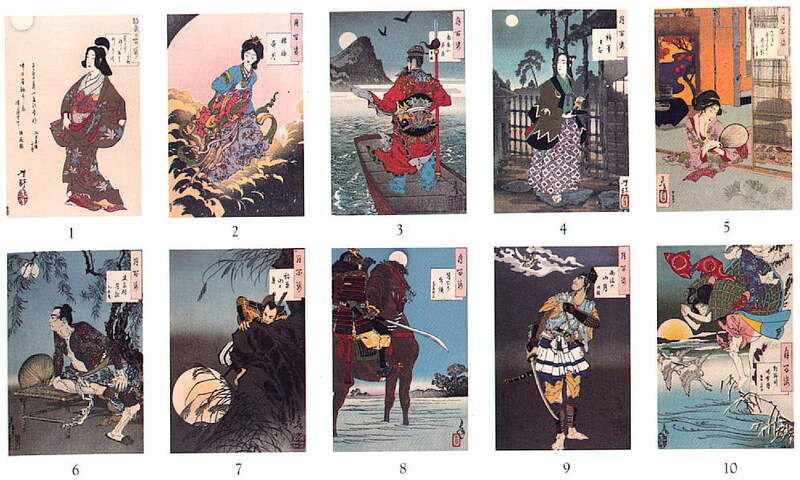 This series is generally regarded today as Yoshitoshi's greatest achievment. 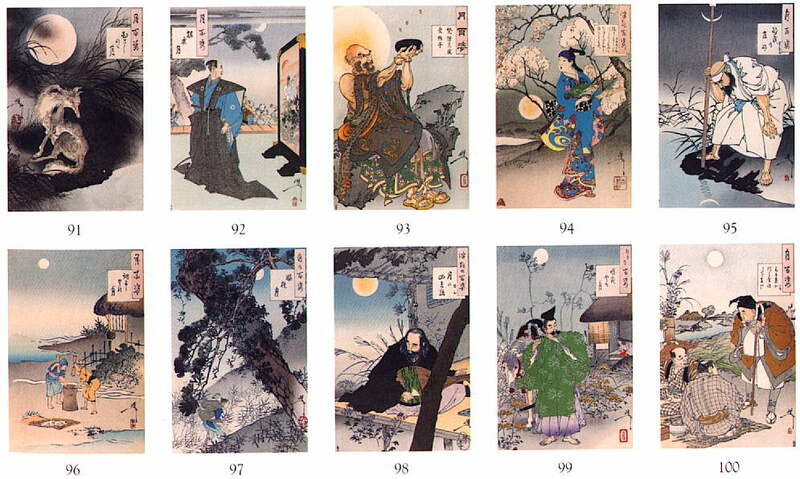 Many of the prints are masterpieces as good as anything ever done by any ukiyo-e artist. 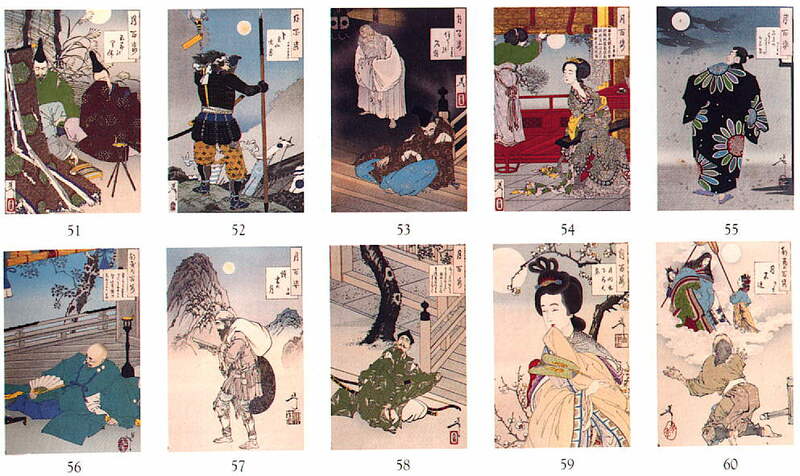 Unusually for Japanese print series, which mostly do not contain the number of scenes stated in the title, this series actually does comprise 100 prints, along with a pair of content pages done by the calligrapher Sogaku after Yoshitoshi's death, a title page in large characters, and an introduction page by Yoshitoshi's friend, the calligrapher Keika. 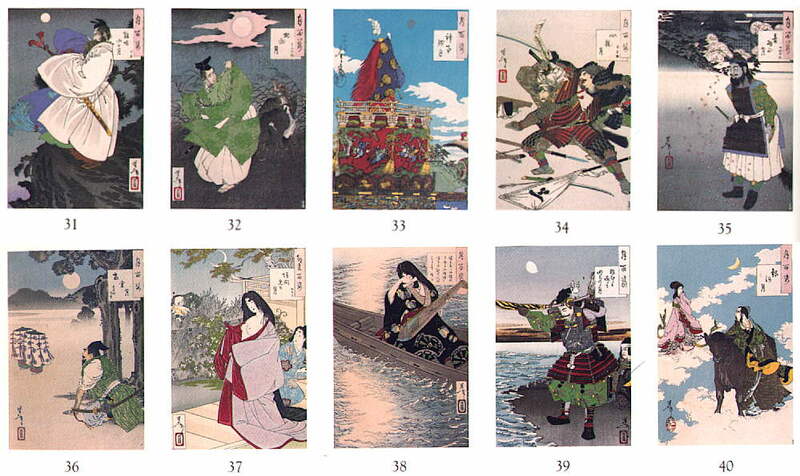 It is also the easiest of Yoshitoshi's many prints and series to find today. 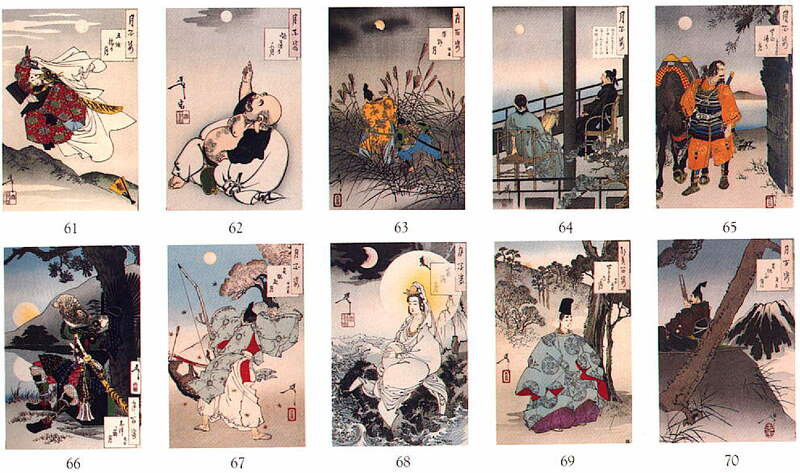 The subjects range over Japanese history and mythology, as well as some scenes from Japanese life (both contemporary, and historical) and Chinese mythology. Although superficially it may appear just like other Japanese woodblock prints, in many ways it contains radical changes, many (but not all) a result of contact with the West. Yoshitoshi pushed his blockcarvers to great heights of technical achievment than anyone before him - and made full use of it. This is most clearly shown in the way the series makes heavy use of rough brushstrokes - which are very expertly reproduced in the woodblock medium, a thing never seen before in Japanese woodblock prints. The convention in woodblock printing up until this had been to show faces in three-quarter view - but in this series he shows people freely, from all angles. 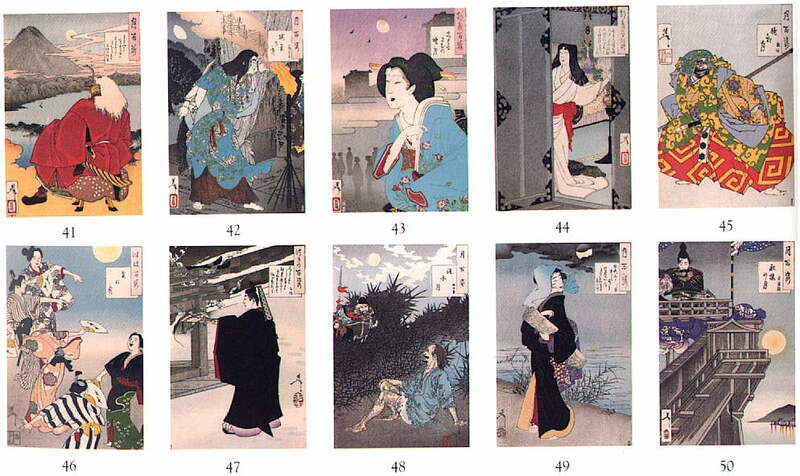 The faces in it are portrayed very realistically, unlike earlier artists such as Toyokuni - although even Toyokuni was more realistic than his predecessors, such as Utamaro. Western perspective techniques are also thoroughly used - although again, this is only obvious by comparison with earlier artists. 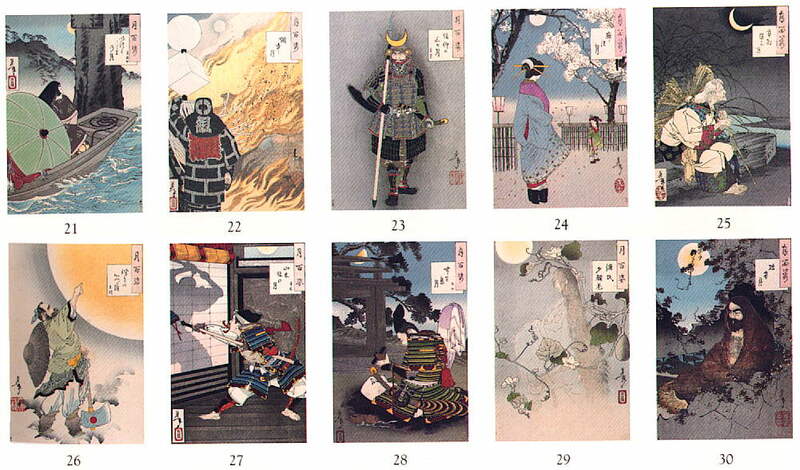 In addition, the series makes heavy use of a number of existing extraordinary techniques, in particular karazuri, or 'gauffrage', which is used in almost every print, in particular in the title block, as well as many clothes. Also seen on some prints are kirazuri and also shomenzuri, which was used to produce intricate patterns on black areas of some prints. 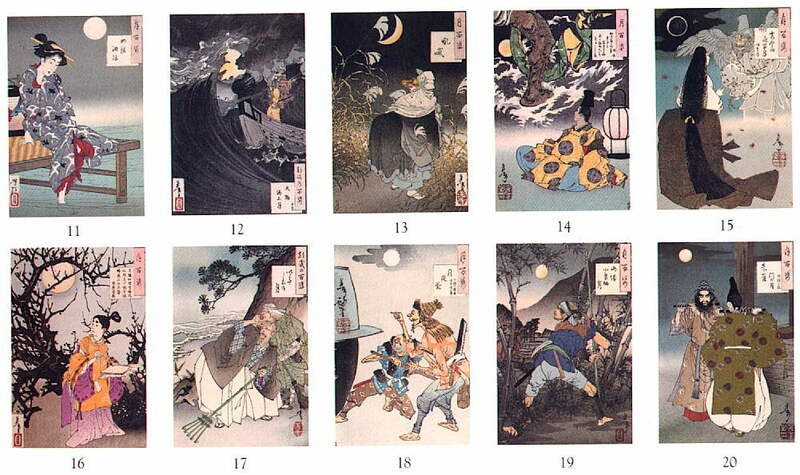 In doing this series, Yoshitoshi was in an almost single-handed struggle against time and technology. 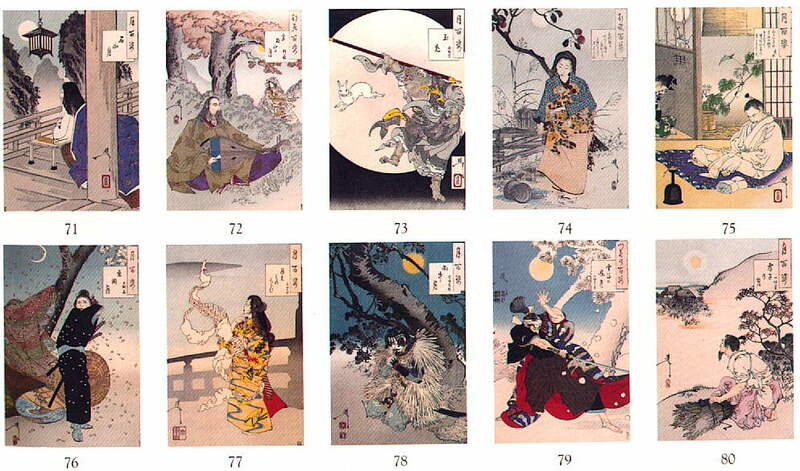 As he worked on it, Japan was adopting the mass reproduction methods of the West, like photography and lithography. Nonetheless, in a Japan that was turning away from its own past, he almost single-handedly managed to push the traditional Japanese woodblock print to a new level, before it effectively died with him. 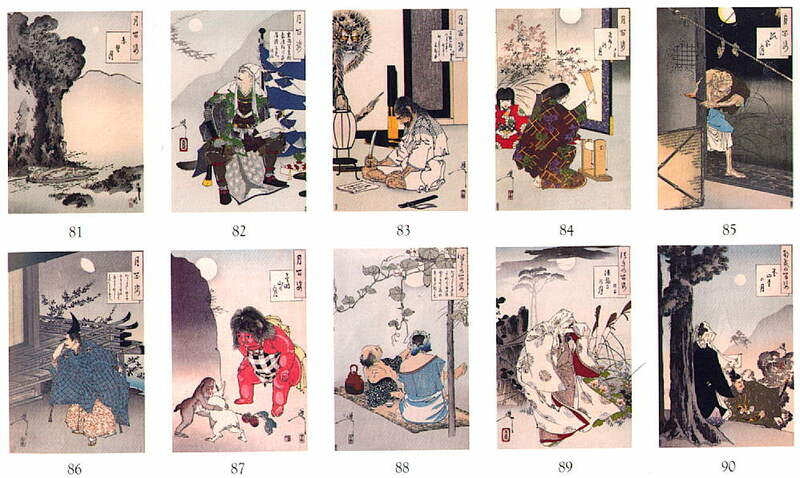 For reference purposes, for those on slow connections, below are links to a complete set of thumbnails of the "One Hundred Aspects of the Moon" series, given ten per page. For those on faster connections, here is a page with all 100 thumbnails on a single page.